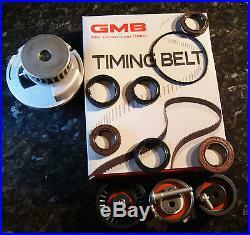 Quality Water Pump GMB Timing Belt NTN Bearings HI-Temp Seals. Sep 1998 - Mar 2000. 1.8L, 4 cyl, 16V, DOHC MFPI , TS, Engine Code X18XE. Apr 2000 - Jun 2004. 1.8L, 4 cyl, 16V, DOHC MFPI , TS, Engine Code Z18XE. Nov 2004 - Mar 2007. 1.8L, 4 cyl, 16V, DOHC MFPI , AH, Engine Code Z18XE. All parts should be fitted by a professional and fitted to vehicle specifications. The item "Timing Belt Kit with Water Pump Holden Astra TS AH X18XE Z18XE 1.8L 98-07" is in sale since Saturday, February 28, 2015. This item is in the category "Vehicle Parts & Accessories\Car, Truck Parts\Engines, Components\Timing Components". The seller is "bearings_and_engineering" and is located in Hemmant, QLD.